Many of Rotor Clips retaining rings are manufactured through a stamping process. While technical drawings of rings have straight lines for stamped parts, the stamping process can create different results. Breakoff is a term used to describe features of a rough surface that tapers back somewhat after the part has been stamped. Burrs can also occur at this point in the stamping process. This makes it difficult to properly measure a ring using a comparator. A comparator magnifies the ring and is projected on a screen. This method is a visual inspection and does not involve actual contact points on the ring, which can render it unreliable and potentially inaccurate. Therefore Rotor Clip has purchased a contracer. 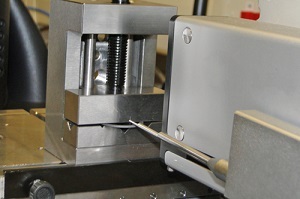 This method of measurement delivers the highest degree of accuracy, measuring the two critical dimensions of a retaining ring. This machine can measure the angle of the bevel of a ring if there is one and also the thickness from the bottom of the ring. The contracer can measure both of these accurately using a dual stylus. The contracer works by programming the machine for the size of ring to be measured. Then the stylus moves along the top of the ring taking data points as it progresses. 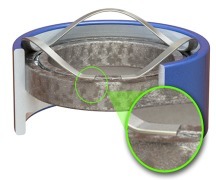 The stylus then shifts and travels along the bottom of the ring measuring data points along the irregular surface and recording the results as it progresses. At the completion of the process a printed profile is generated from the highest two points at the top of the ring and the lowest two points at the bottom (this portion is critical since it engages the retained part). The program will then show the exact dimensions and whether or not they conform to specs. The methods of producing rings and the method of measurements can vary. However, use of the dual stylus contracer has proven itself to be a valuable tool in yielding accurate results that can attest to the proper functioning of the part in application.